Here's a MARVEL UK House Ad for DARK GUARD (starring… guess who?!?) from September 1993. This was M-UK's equivalent of THE AVENGERS: pulling together their most bankable roster of GENESIS 92 stars in the hope that it would muster some of the previous blockbuster sales levels of a few months earlier. The first issue featured a lenticular cover enhancement to make it all shiny and new. 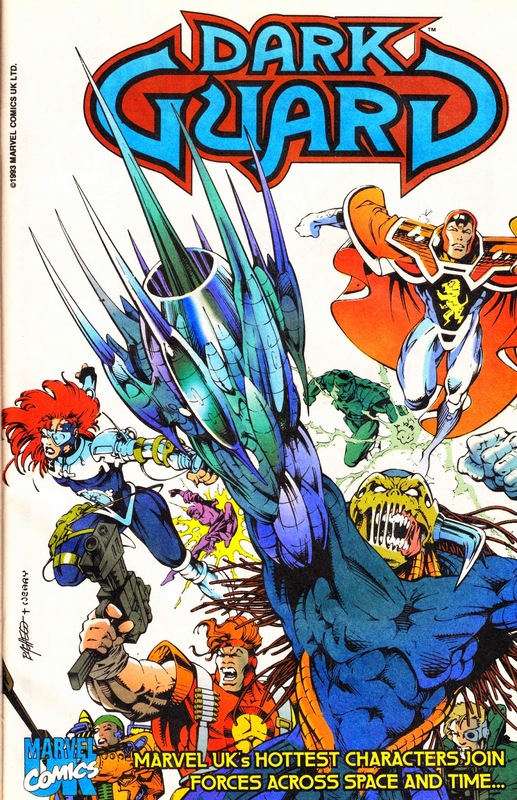 The title only clocked-up four issues before succumbing to the GENESIS IMPLOSION at the beginning of 1994. Issue five was solicited in MARVEL AGE MAGAZINE but was never published. DARK GUARD GOLD: OLD FRIENDS was announced for April 1994 but never appeared. It seems likely that material originally intended for issues 5-6 of the monthly would have appeared here instead.